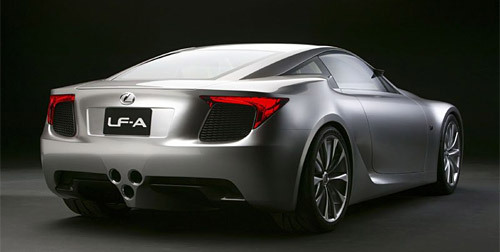 As for when the Lexus LF-A will appear in dealerships, the company hasn’t set an exact date yet. But Lexus insiders suggest the car’s on-sale date has been delayed while the company fine-tunes everything from styling to performance. It’s believed Lexus is targeting a top speed for the LF-A of 350km/h, ensuring it’s viewed as a serious supercar contender against more fancied brands such as Ferrari, Porsche and Lamborghini. Currently, overseas reports have the LF-A nudging 330km/h, which is apparently not good enough for Lexus engineers. Development cars spotted testing at the Nurburgring track in Germany also show a car with a high-mounted rear wing, suggesting the LF-A could be fitted with a retractable rear wing that rises at higher speeds and sinks into the boot at city speeds. I wonder if the recent rumor of the LF-A setting a new record at Nürburgring is an indication that the engineers have been successful. Also, I think an automatic rear wing that adjusts itself depending on that car’s speed to be an excellent idea. I was previously unimpressed with the look of it, but in this context it makes much more sense.